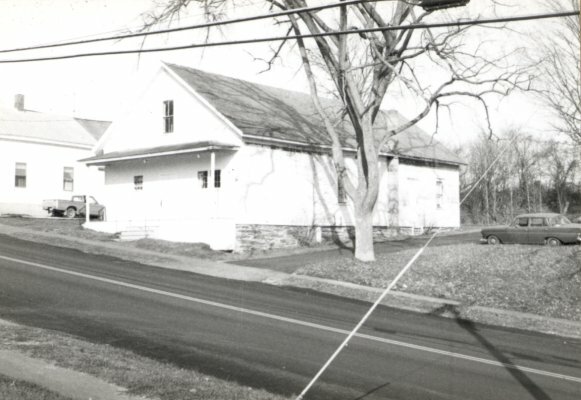 Old Grange Hall - 1155 Main Street - Date of search ??? 30 x 60' clapboard structure. 1 1/2 story, 3 x 3 bay, stone foundation. Gable end facing street, center entrance onto an open front porch with square post supports. A second entrance is located right of the south facade. Door surround has lip that is repeated in the window surrounds. 2/2 window, except in front where there is a 6-light window left of the entrance and a set of 6-light windows right. A cinder block chimney has been attached to the south facade. This plain structure was built sometime after 1871. I expect the rink was built the summer of 1888 as this tax record is dated May 1889.